connected with Haunted Dimensions on FaceBook at Ray Keim - Haunted Dimensions. The First "Knoll" Model Released! 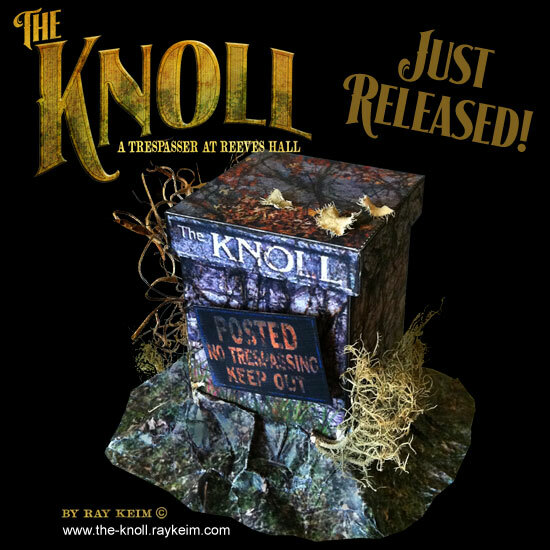 The first paper model from my series, "The Knoll - A Trespasser at Reeves Hall", has been released! 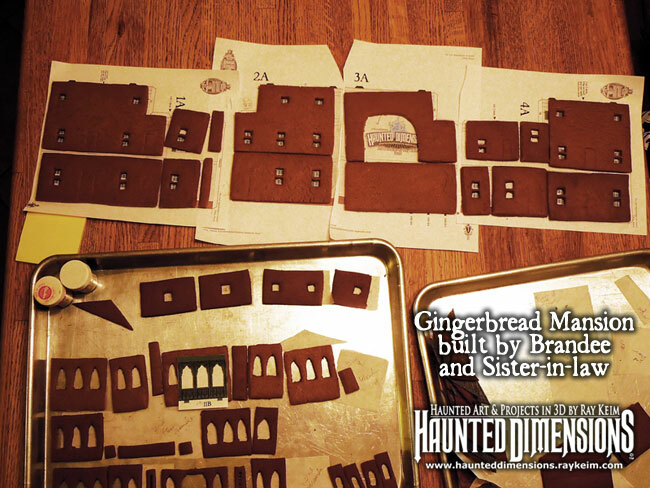 Brandee and her sister-in-law modified my New Orleans Square Haunted Mansion paper model kit to use as templates to cut the gingerbread walls. 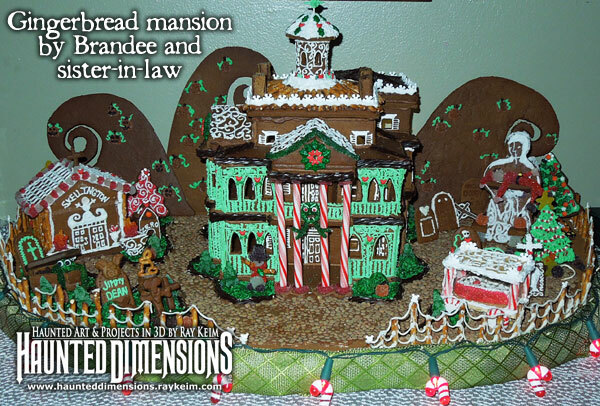 The result is this spectacular haunted mansion gingerbread creation! Surrounding the mansion are wonderful details such as humorous tombstones and the "Skellington" crypt. Despite having my paper model as a guide, this still required a phenomenal amount of skill to modify the parts to work as gingerbread and the artistic skill is apparent. Seeing this creation was a great Christmas gift for me! 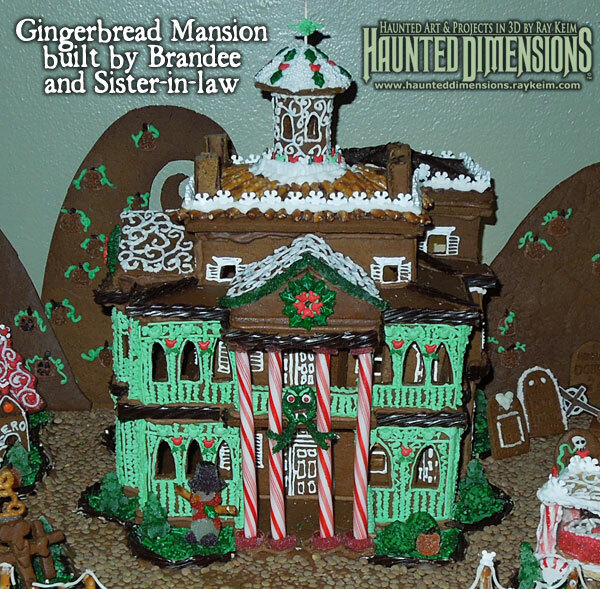 For more gingerbread inspirations and the opportunity to download instruction to create my Phantom Manor Cookie House, go to "Gingerbread Dimensions". As usual, my Halloween season has been so busy it left me little time to actually prepare anything for Haunted Dimensions FOR Halloween. This Halloween my thoughts are with my fellow Yanks in the Northeast who were battered by Sandy. I want to thank Cory Doctorow for once again giving a Halloween shout-out to Haunted Dimensions on Boingboing.net yesterday! 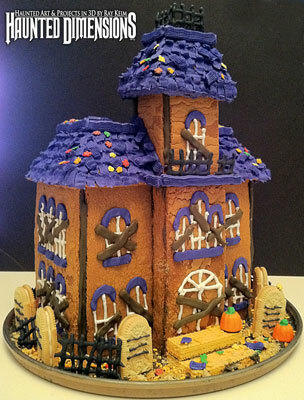 This time he featured my Phantom Manor cookie house project. I also want to thank Inside the Magic for a very nice article about the interactive, online and in-park game I helped to develope for this year's Universal Orlando Halloween Horror Nights event. 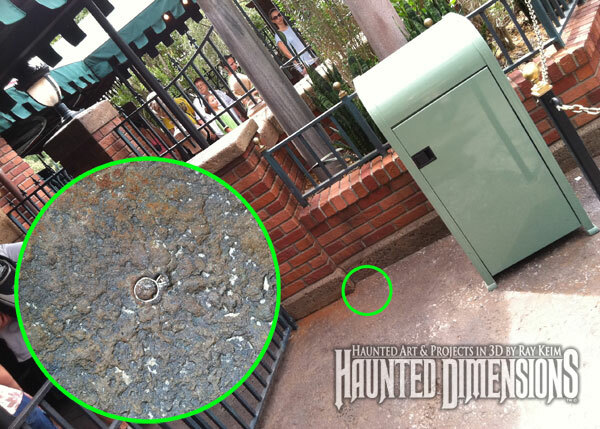 "Horror Unearthed" includes online games and in-park quests for players using RFID technology. To learn more, read the article and watch the short video of our in park finale and Q&A session with players which took place on the Horror Make-up Show stage at Universal. Below is an image taken from the video showing me and my cohorts revealing ourselves to the players after leading them all over the park as part of the final task. The Knoll - A Trespasser at Reeves Hall! The teaser site for my newest project, "The Knoll", is finally up and running! I am hoping to begin the story before Halloween. Be sure to click on the theme music by Kevin MacLeod. I scored the new set of mansion tombstones today! 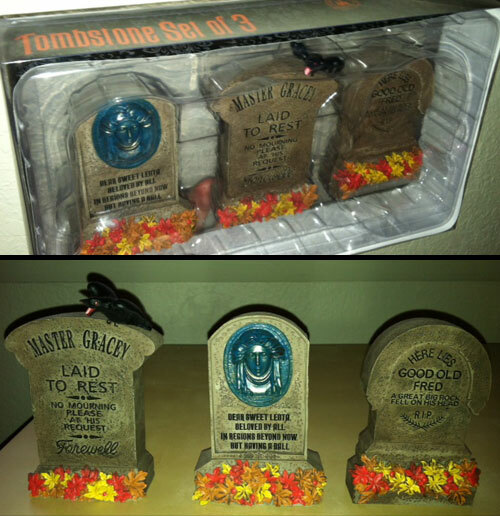 They are beautiful miniature versions of the Good Old Fred, Master Gracey and Madame Leota tombstones. They are 4 inches (10 cm) tall, cast in a very heavy material and have great detail. I found mine at the Disney Quest store at Downtown Disney in Orlando but I'm sure they are available in many other places outside of the parks (and they are also available at Disneyland in California). If you can't get your hands on these, don't forget, you can download and build your own paper versions from Haunted Dimensions. Haunted Dimensions reached an amazing milestone of recording over Two Million visits! In that time there have been over One Million downloads of my paper model kits. I have heard from thousands of people who have been inspired and encouraged by successfully completing the projects, which has been very humbling and wonderful. Thanks to all the Haunted-Dimensioneers who have made my site and projects such a huge success! SCORE!!! 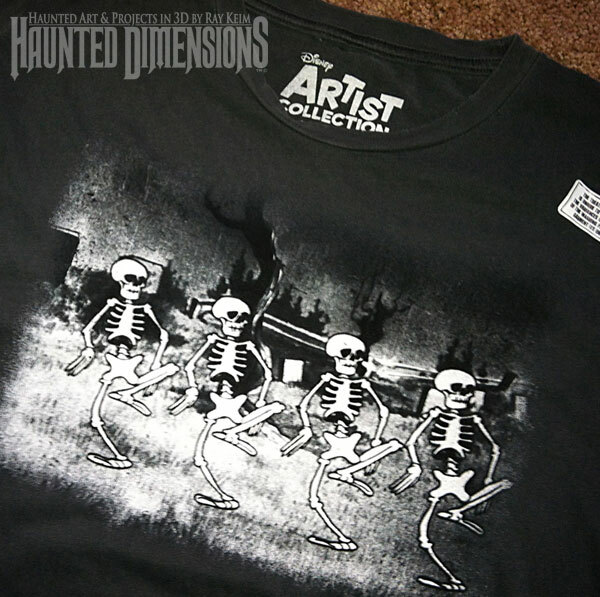 I snagged the last Disney "Skeleton Dance" T-shirt on the rack at my local Target. Didn't think I would actually find one, and nothing short of something so cool would even get me in a Target (especially on a Saturday in Orlando)! It's part of the "Disney Artist Collection at Target". Thanks for the heads-up, Inside the Magic! Made my day! It only cost $12.99 but I found one on Ebay for $50! Keep in mind that this particular shirt design has been deliberately "distressed", meaning that the cuffs and collar have small holes snipped in them, giving it a slightly tattered appearance. 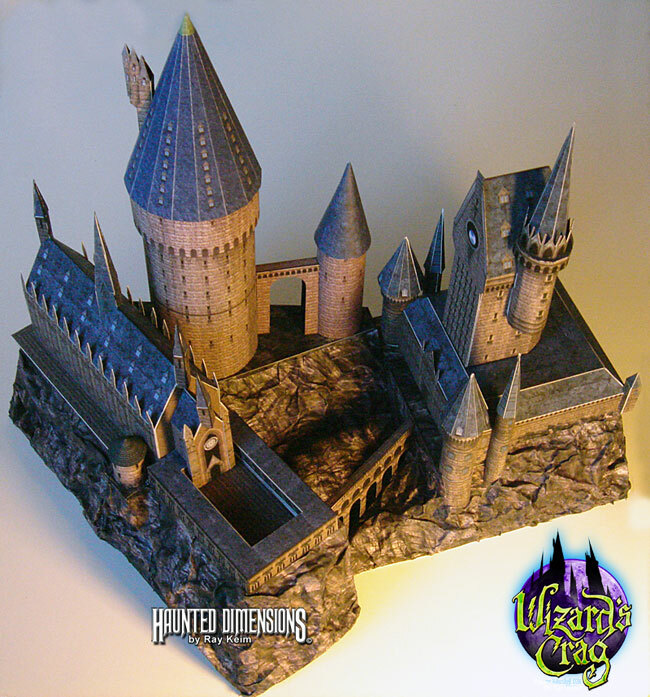 If you follow my Haunted Dimensions blog or my Haunted Dimensions Facebook page, you will know that I've been working on, what I hope to be, a new concept for the way I design and release a paper model kit. 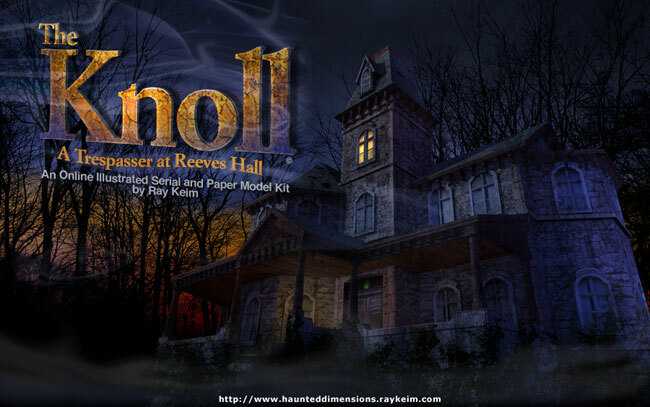 "The Knoll - A Trespasser at Reeves Hall" will be my attempt to create an original paper model, with its own back story. When the project is complete I will begin to release the illustrated story and model parts in increments over the course of several weeks (months). At the end of that time you will have a complete mansion and know what mysteries and horrors it contains. This illustration is the first representation of "The Knoll". Last week I was front and center for the re-creation of the panic scene from "The Blob" at the Colonial Theater in my home town.The Colonial Theater in Phoenixville is famous for being used as a shooting location for the 1958 classic, "The Blob". It was a wonderful tribute to kitschy American pop culture! Try to watch it full screen. Note the sound of the barking dog who was at an apartment window above me, who knew something was terribly wrong. I had the privilege to meet a great Haunted-dimensioneer, Jake, who was visiting the Orlando parks with his family, from Scotland. Jake LOVES the haunted mansions and he wanted to meet me while they were here. He is an amazing guy! 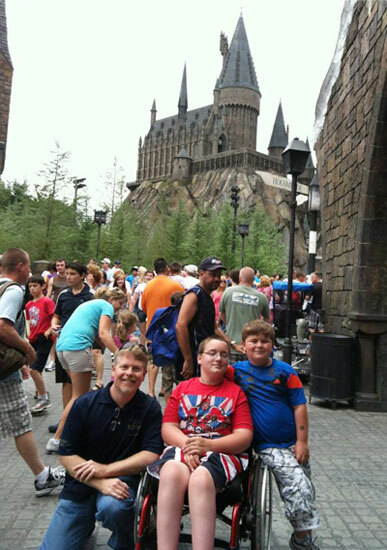 This is a shot of me, Jake and his brother, Bruce, at Wizarding World. 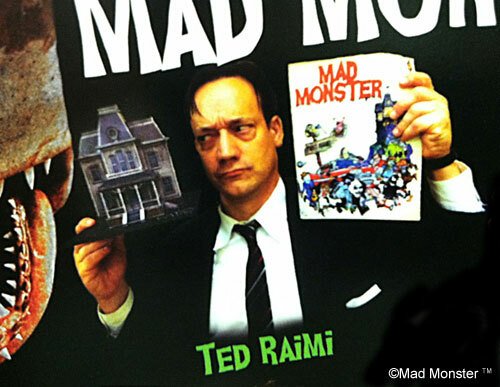 In the second issue of Mad Monster Magazine is a shot of Ted Raimi holding my Bates House paper model (featured in issue #1 of the magazine) ! He also called ME "a mad genius". Awesome! 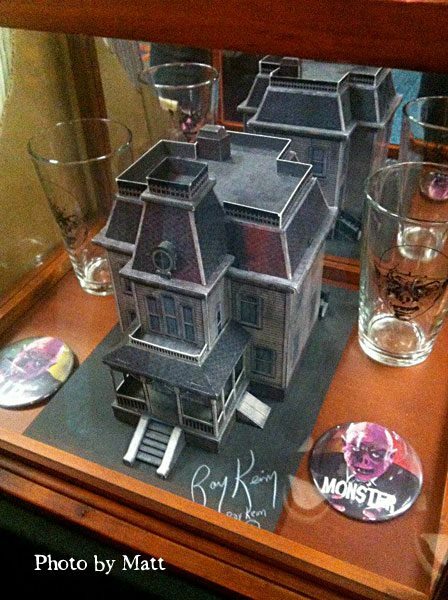 Matt spotted my "Old House on the Hill" paper model kit on display at Monsterpalooza in LA last month. "Old House on the Hill" was featured in the first edition of "Mad Monster Magazine" last year. 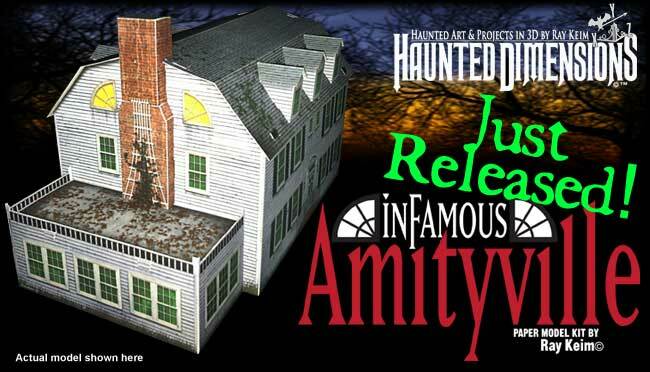 "INFAMOUS AMITYVILLE" Paper Model Kit Released! 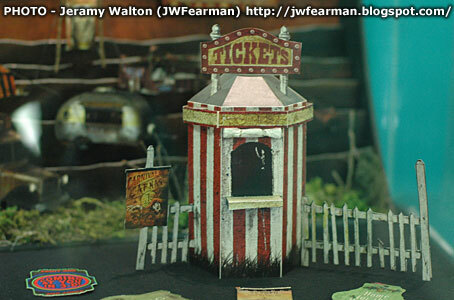 I've added a new free paper model kit to my "Paper Model Purgatory" collection! "Infamous Amityville" is relatively easy to build and consists of only 6 pages. Of course, it is all about those "evil eye" windows! "The Serious Art of Make-Beleive-from the archives of Universal Orlando Resorts"
The subject matter ranges from Halloween Horror Nights, and Mardi Gras to "Grinchmas". "Enjoy a rare opportunity to peek inside the creative genius behind the theme-park entertainment experience. Discover how imaginary worlds of unique characters, objects, and environments start with the art and design revealed in this exhibition of more than 200 original detailed drawings, architectural plans, and models from the resort's signature annual events including Halloween Horror Nights®, Mardi Gras, and spectacular holiday extravaganzas." Captain Culpepper's crypt, next to (or under) the trash can. This is only the second time I ever built my own Phantom Manor cookie house. The first one being the one I built for Gingerbread Dimensions! Due to time this one is much more basic than the first but I'm very happy with it! You can see some "making of" photos on my Haunted Dimensions Facebook page, HERE . 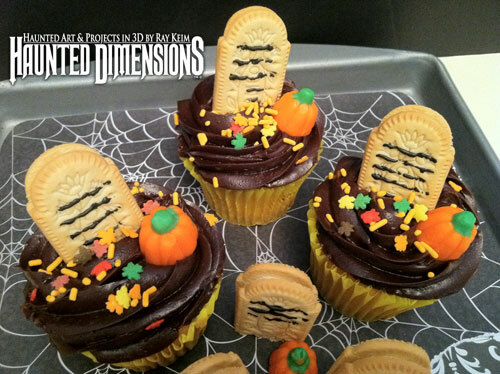 I also created cool little cemetery cupcakes to accompany the Manor. Everything is store bought. "Cameo" Creme Sandwich Cookies by Nabisco, make awesome New England tombstones! I scribbled black icing on cookies and stuck them in store bought cupcakes along with some autumn leaf sprinkles (from Michael's Crafts), and a candy pumpkin on each grave. Last weekend I attended "Mickey's Not-s-scary Halloween Party" at the Magic Kingdom. The "Boo To You" parade at the Magic Kingdom (part of "Mickey's Not So Scary Halloween Party") was wonderful! Of course, my favorite portion of the parade (besides the Headless Horseman's appearance) is when the Haunted Mansion characters come through! I love the sparking shovels of the grave diggers and the flopping heads of the ballroom dancers! A brilliant production! 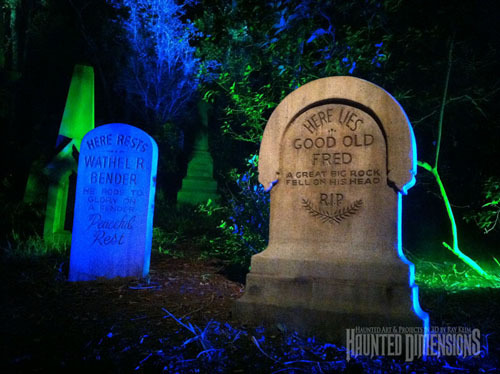 More about "Not-so-scary" and the new Haunted Mansion queue coming soon! Exclusive video of Haruo (GODZILLA) Nakajima stomping on my Bates House model at Monsterpalooza last month! My paper model kit, "That Old House on the Hill" is featured in the first Edition of Mad Monster magazine. Check out my report from Eastern State Penitentiary about their new interactive program, "Hands on History"! I found it necessary to build one of my paper model kits because I keep giving them away. Since I had a camera handy I decided to record the construction and play around a little. This is the first time I have attempted this type of "animation" and my first YouTube upload! I had no script and I wasn't even sure if all the photos and video I took of the process would be usable in crating anything interesting. Now I wish I spent more than an afternoon making it! Our cat, Misti Kay, makes a quick cameo, among other guest stars. Some of you may know Misti Kay as the critter who smashed my first New Orleans Square model prototype back in 2005. Unlike my past paper model kits, this one has attracted the attention of Universal and Warner Brothers. This attention could mean one of two things. It could be purchased and merchandised by these companies or, due to its discovery by these companies, end up becoming a liability to me and thrown on the scrap heap. Either way it looks like this one will not become a Haunted Dimensions free download. Very discouraging and frustrating for me (and the thousands of fans who want one!! 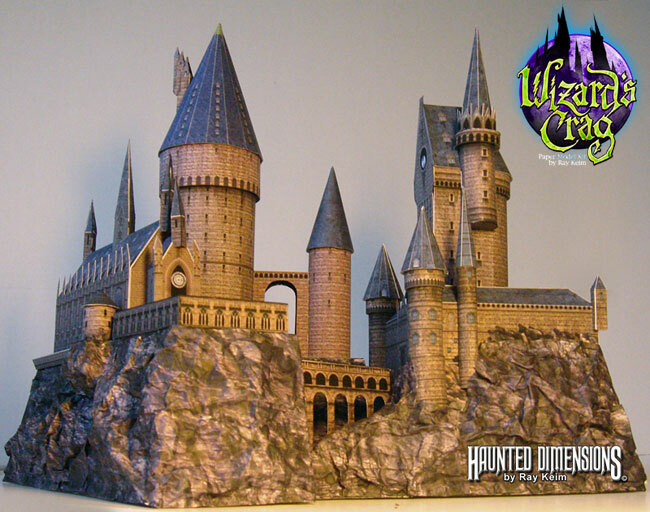 UPDATE- A Few Words About "Wizard's Crag"
Unlike my past paper model kits, this one has attracted the attention of Universal and Warner Brothers. This attention could mean one of two things. It could be purchased and merchandised by these companies or, due to its discovery by these companies, end up becoming a liability to me and thrown on the scrap heap. Either way it looks like this one will not become a Haunted Dimensions free download. Very discouraging and frustrating for me (and the thousands of fans who want one)!! I will keep you updated if the situation changes. please visit the Haunted Dimensions blog archives at haunteddimensions.blogspot. Please help support my efforts here in the Haunted Dimensions. The button will allow you to donate whatever you wish using a PayPal account or a regular credit card.